While our recent weather leaves us thinking otherwise, the children and teachers at Rivendell Preschool know that spring is on the way! They can be certain because their Growing Connections curriculum guides and encourages weather watching, discovering weather patterns and learning about what plants need to grow in our toasty greenhouse or the school backyard. This photo of the backyard provides the proof! 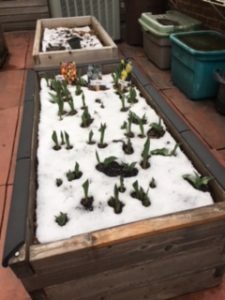 Spring blooming bulbs, planted by the children with Growing Connections teacher, Brigitte, and intern, Charlotte, last fall, are peeking out under the snow! https://www.rivendellnyc.org/wp-content/uploads/2018/06/logo-site-tree-kids-649x89-REV.png 0 0 Brigitte Yohe https://www.rivendellnyc.org/wp-content/uploads/2018/06/logo-site-tree-kids-649x89-REV.png Brigitte Yohe2018-03-14 12:07:032018-03-14 12:07:03Spring IS coming!